Markets are unnervingly calm these days. 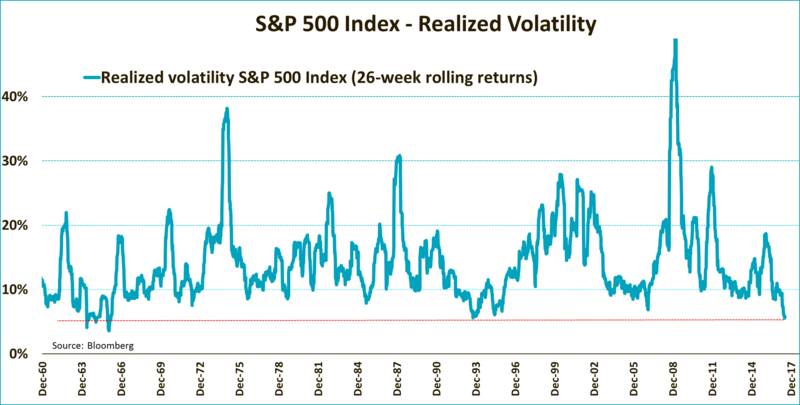 During the last six months, the realized volatility of the S&P 500 Index fell to the lowest level in more than half a century. Currently, US equities are less risky than gold, perceived by many as one of the safest assets, and only slightly riskier than US bonds. Do market circumstances allow for this historically low level of market volatility or have investors become complacent? What we know is that investors expect volatility to remain low for the foreseeable future. Implied volatility, as measured by the VIX Index, is also close to record-low. And it has been there for quite some time. Since the early 90’s, the VIX Index closed below 10 on just 26 occasions. No less than 16 out of those 26 ‘below-10’ closes occurred in just the last three months! So, what caused volatility to drop this much, and for so long? One argument is economic growth. Not because GDP growth is so great, but it is extremely stable. 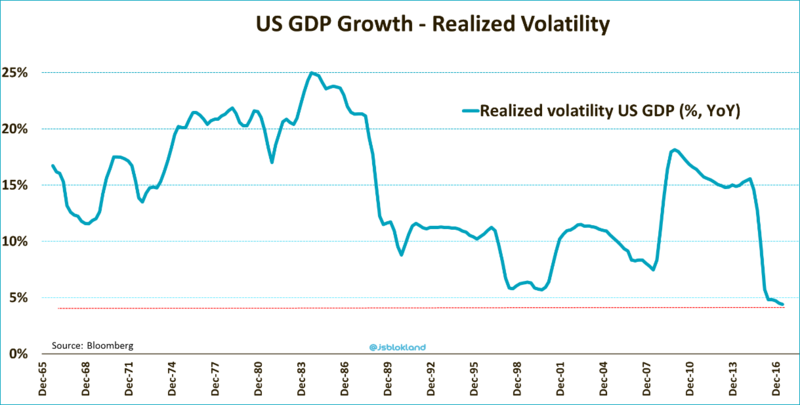 As the chart below shows, the realized volatility of year-on-year US GDP growth has come down significantly in recent years. Investors like a boring, but at the same time predictable economy, because this makes it less hard to estimate company profits. Stable economies also tend to lower the probability of default. Hence, it seems reasonable to assume that more economic transparency is reflected in lower volatility levels. Next to economic risk, political risk has also abated somewhat. Especially in Europe, where fear of a populist swing to the right was overdone. In addition, investors have developed a decent coping strategy concerning Mr. Trump as US President. Probably also because the US President has got little done so far. At the same time Mr. Trump remains the ‘perfect’ candidate to make geopolitical risks spike. The rise and rise of passive investing is often mentioned as a factor pushing down volatility. The continuous inflow of (new) money into ETFs supports markets, causing volatility to fall. While this sounds plausible, data suggest otherwise. Passive funds, by definition, do not discriminate between stocks, good or bad. This implies that each of these stocks is ‘supported’ to the same extent by ETF inflows. 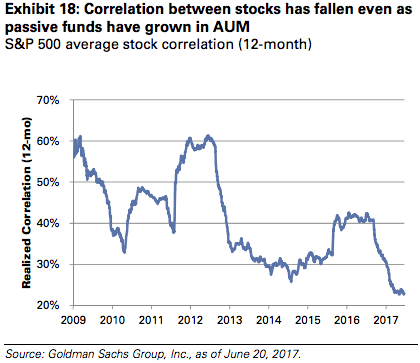 But the chart below from Goldman Sachs reveals that the correlation between individual stock returns has decreases sharply, despite the growth in passive assets under management. It has become increasingly difficult, if not impossible, to not mention central banks when it comes to financial markets. So, here we go. 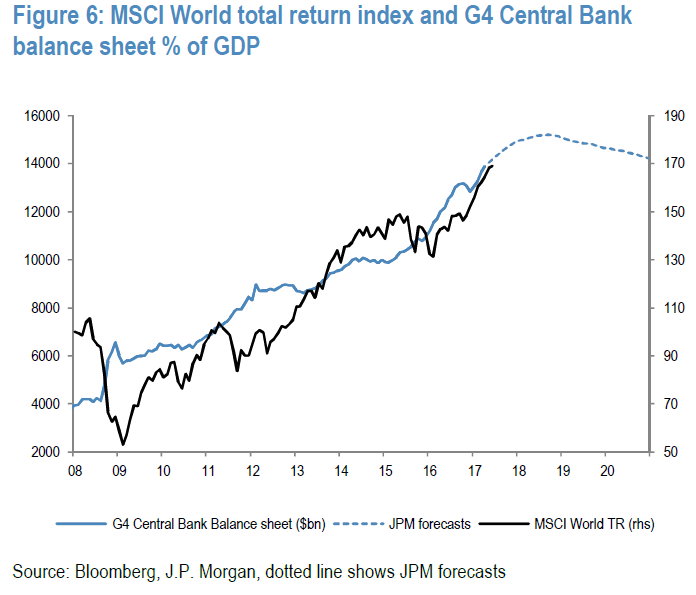 The chart below demonstrates that, at least to some extent, the massive stimulus by central banks has found its way into the equity market. Never before was the central bank ‘put’ so noticeable. Obviously, having central banks on your side makes you sleep a lot better at night. So, no complacency then? Well, probably just a little. Out of the four arguments mentioned above, two are likely to push down volatility, but the other two do not, or in case of central bank stimulus only for another brief period. Central banks all over the globe are positioning themselves to reduce some of their extraordinary measures. The Federal Reserve has already started hiking interest rates and it will ‘relatively soon’ start to wind down its balance sheet. Central banks actually cutting liquidity is something we haven’t seen for more than a decade. This puts more pressure on earnings growth, especially in the US, where valuations are stretched. 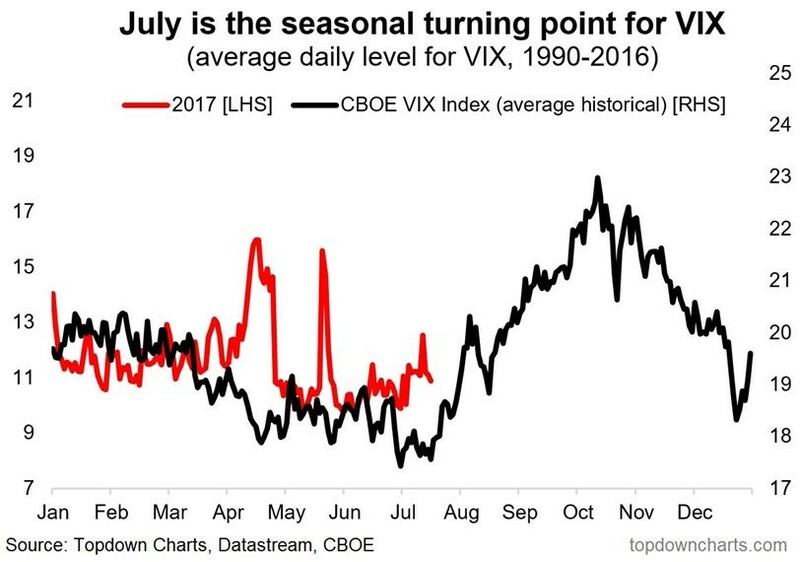 In addition, history shows that the VIX Index tends to rise during the next couple of months. While investor complacency seems to explain some of the current volatility level, this doesn’t automatically mean markets would have to collapse any time soon. 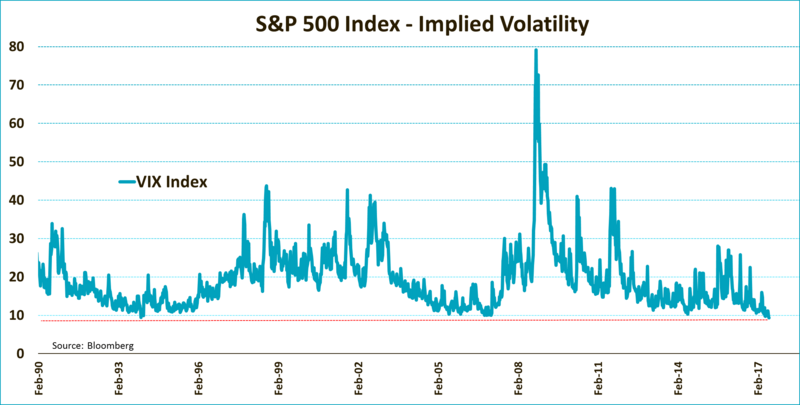 Historical data also reveal it rarely happens that volatility spikes from these low levels. ← Betting on rising volatility is a loss-making strategy!